Paper is made from wood or other similar materials, therefore, is a combustible material which is able even to self-ignition. This can occur if the ambient temperature reached a critical level. Paper, and other combustible materials susceptible to ignition upon reaching a certain temperature. The ignition of the paper takes place in several major cases. The first of these external factors, in other words - ignition of the paper. In this situation, implying the carrying of open fire to the paper sheet, the sheet is affected by a high temperature, resulting in ignition. The temperature of the open fire, depending on what material is used for combustion, can range from 800 to 1300oc: obviously, this temperature is sufficient to ignite paper. However, in some cases the paper may catch fire and without some external influence. This is possible in a situation of so-called auto-ignition. The ignition, that is, the occurrence of explosion or open flames on the surface of the combustible material occurs when the ambient temperature reaches a certain critical level. Specified critical temperature depends on the density of the material, its Flammability and some other indicators. You should bear in mind that the paper in this respect is a fairly flammable material. The average temperature of the environment in which it takes place and the ignition is in the order of 450 ° C, but may vary slightly depending on the variety and the density of the paper and its moisture content. 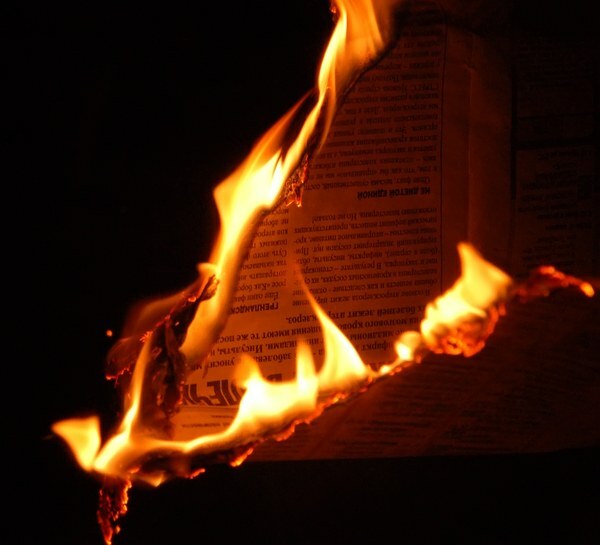 Thus, if the paper be placed in the environment whose temperature exceeds 450 ° C, or gradually bring the temperature of the atmosphere to the value, paper will ignite, that is, on its surface there open fire. A similar reaction will occur in the case of premises of paper in the environment with higher temperature, as for example with open fire. In the literature can be found mention of the fact that the ignition temperature of paper is 451 degrees Fahrenheit, equivalent to about 233 degrees Celsius. In this case, an argument to prove this point is the title of a novel by American writer ray Bradbury "451 degrees Fahrenheit", which was allegedly given to him in honor of the combustion temperature of paper. A simple experiment with placing the paper in an oven at a temperature of 250oC shows that auto-ignition of the paper at this temperature does not occur. In one of his interviews the writer later admitted that he simply confused the designations of temperature scales, after consultation with a friend the fireman.